I am challenging moms everywhere to take a moment to be in the picture today with your kids (big or small)! It is so important to not only capture them at these ages and stages, but to capture you with them. You are their mother. If your kids are little, you are their everything. You are their whole world. Do them the honor of capturing that so when they grow, they can look back and remember how much you loved them. If your kids are grown, your role may have shifted a bit, but you are still and will always be their mom. Jump in the photo with them! Life is too short and we simply don't know how much longer we will be on this Earth. Give your kids the gift of photos with them. It is something they will treasure forever. Instead of staying on my soap box, I enlisted the help of a few other mamas to show just how important being in the images can be! "[I love] being able to capture the way my child looks at me, smiles at me, laughs with me and it makes me feel like I am the most perfect person in her world. And it makes me so proud to be her mommy. I have everything from maternity to newborn to milestones to family sessions [displayed in my home] and I cherish them all. Having photos that my child can look at and see will reassure her that she is loved and appreciated since before we even met her." "The Mommy & Me event makes me feel like a mini celebrity... it's always nice to be pampered and feel 100% beautiful but then to share that beauty with my little girl next to me, who feels "so pretty" in her dress, just smiling, laughing and dancing, gives me such gratitude to share in these moments with her that she will be able to see as she grows up. A single picture can tell an entire story and reflect so much love, I only hope she sees, in these photos, all the love I have for her now, until forever." 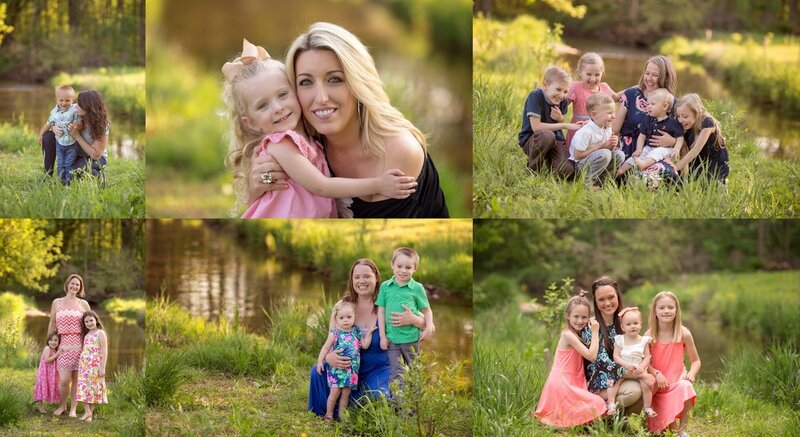 "I was in a mommy & me session with my five precious children recently. What a great experience it was. As a homeschooling busy mom I rarely can get all of my kids together for pictures. But when I do I am usually not in them because I am the one taking them. So having this opportunity to dress up, have some tickle and laughter time with my fast growing children while have our pictures taken was priceless to me. Angie captured lots of sweet moments that will be cherished for a long time by me and my kids as they grow up." "Being able to actually see the happiness and love in my sons face when he looks at me is a precious memory! A memory I will get to share with him for many many years to come thanks to the Mommy and Me event! [These pictures] mean a lot! I don’t get to do many mother son things, but I’m so glad we were able to do this together! I will treasure these photos forever!"